Heyworth Public Library provides public access to three computers for adults and children who are at least 11 years old. Patrons are allowed one hour of computer time per day on a first-come, first-served basis and may extend their session if no one is waiting. Anyone wishing to use a computer must sign an Computer Use Agreement. 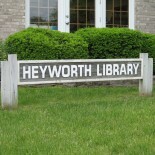 A Heyworth library card or driver’s license will be required. Children, ages 11 years to 17 years, must have written permission from a parent or guardian. Internet use is monitored and access will be denied if violations of the policy occur. Computers may be reserved up to 24 hours in advance. Printers are available at the public access computers. Free wireless access to the internet is available in the library. The password is posted in the building. The library has a coin-operated copier available for public use. The library has a fax machine that can be used to send and receive faxes. See a staff member at the front desk for assistance. The staff will laminate library cards and items of a similar size for $1.